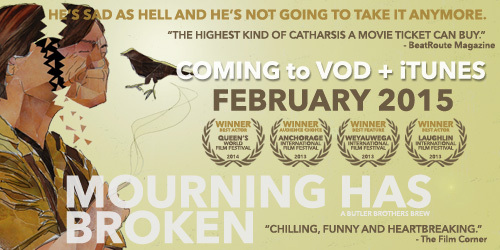 We’re excited to announce that Mourning Has Broken will be released on VOD and iTunes in the February of 2015. ‘Mourning’ will be available on VOD in 47 countries with a French subtitled version also on tap! Many thanks to Avi Federgreen of Indiecan Entertainment for getting this critically-acclaimed feature out into the world and into your households.